Terrakion is a deck that is all about taking down the main players in the metagame, predominantly those Lightning type Pokemon such as Zekrom, its EX counterpart, Eels and the rest. It is a hefty Basic with 130HP and has the heaviest of attacks not only when hitting regular Pokemon, but those double Fighting weak ones too. The only Pokemon you run here is Terrakion and the idea is to start using Retaliate and Land Crush every single turn, which is a lot harder to deal with than it first sounds. Exp Share from Next Destinies really makes the deck playable since you attach it to your a Terrakion without energy attached and when the active is knocked out with energy attached, you get to move an energy from the just knocked out Pokemon, to the one with Exp Share attached. What this allows you to do is chain Retaliates for 90 damage in a single turn since you can only do the 90 damage when you suffer a KO in the first place. Overall, this deck is slow to get going, but rolls through anything with Fighting weakness and puts up a really good fight against anything else for that matter. 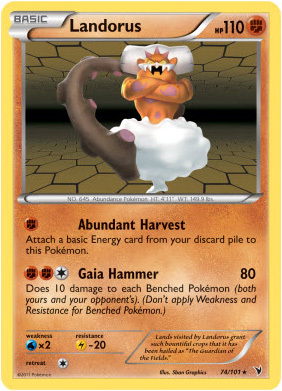 Crushing Hammer: This card is usually a very familiar sight in Durant decks, but it can be included in here for exactly the same reason, disrupting the opponent’s energy drops while ploughing through their other Pokemon with Terrakion. Sure, the card only works when hitting a heads, but you will be able to put your opponent back a whole turn when hitting this one right. This card can work better in the early game than any other stage in the game since you will be starting off slow with no initial energy acceleration, but in the late game this can also be a game changing flip that, if heads, puts your opponent in a very tight spot while staring down a fully powered Terrakion. Definitely try this out if you have any space left for giving your opponent even more of a headache when playing against this deck. Defender UD: Not a very commonly seen card at all in this format since Eviolite is so much better in every way. However, you are already using up your Pokemon Tool space on Terrakion with your Exp Share, so you’ll have to prepare another way to sponge damage on your Terrakion to keep them alive for longer and this is the very way to do it. By running even a single copy of this card, you could deny your opponent a crucial KO in the prize race and that could be the difference between winning and losing a game. By sponging just 20 damage for one turn makes sure that your Terrakion won’t get a simple Pluspower + Bolt Strike KO from any rogue Zekrom and can stop the simple plays from happening so definitely try this out if you want a situational tech that can also save you once in a while. Pokegear 3.0: Pokegear is a card you are always going to find in the tech suggestions section of a deck that has as much room as this one since it just makes your deck that little bit more consistent, especially when you don’t have any help from your Pokemon. Being able to use this either in the very early stages of the game to search out a certain supporter, the mid game to save a dead hand, or the end game to grab a crucial hand refresher to seal the game, this card will always come in handy. You don’t even need to have it in your hand either since every time you use this card once, it is available through Junk Arm later on if you really do get desperate for draw power, which this deck really relies on. If you’re one for consistent decks, then try one or two of these to keep your deck running smoothly. Landorus NV: Landorus pretty much gives this deck a little more speed since you can actually do something more constructive on turn one to guarantee some heavier damage when it gets to turn 2. Abundant Harvest is the attack you want to be using turn 1 with this guy since it allows you to take a Fighting Energy from the discard pile and attach it to Landorus. This gives Landorus 2 energy on the first turn, ready for a third attachment the following turn to use Gaia Hammer for a decent 80 damage. Getting that initial energy into the discard pile shouldn’t be too hard since you run high amounts of both Junk Arm and Juniper and the turn two 80 can easily turn to 160 when facing a Lightning opponent. Pair this guy’s HP with the -20 Lightning resistance and you’ve got another really solid weapon against Zekrom and friends. Mewtwo EX: One of this deck’s main issues is playing against a Mewtwo with a ton of energy on it. Even if you do have the ability to two shot an offensive Mewtwo with a double Retaliate, that could be hard to pull off if you don’t have the resources on the field. If your opponent spots that you have missed either an energy drop or Exp Share attachment then they can freely go aggro Mewtwo on you with you having no way back. However, you can also run your own Mewtwo to either counter this strategy outright by using Exp Share to power it up in one turn, or simply make your opponent think twice about playing their own. If you even threaten that you are going to return KO a Mewtwo with X-Ball by putting your own Mewtwo on the bench with Exp Share attached, you could be free from the Mewtwo onslaught. Just be wary of the risks of doing this. Definitely one to try out. You said that there are 12 energies when you only put 10?